Jim Terrien (see pages 7 to 9), and possibly someone else, but he cannot recall who. --According to Ken Littleton, from his interview with Willis Krebs, he went outside at approximately this time "for three or four minutes" and heard leaves rustling by the cypress trees (p. 8 and p. 35). 9:30 pm to 9:35 p--According to Tommy Skakel, from his interview on 10/7/93 [footnote 1] with Willis Krebs, Richard McCarthy, and Manny Margolis, he and Martha Moxley commenced a sexual encounter at about 50 feet to the rear of the house, in the middle of the rear lawn, which concluded in mutual masturbation. Tommy estimates that the entire encounter lasted about twenty minutes. He last saw Martha hurrying across the rear lawn towards her home. --Julie, before being put under hypnosis on 3/5/93, recalls returning to the Skakel residence after dropping Andrea home (p. 3) at this time. Under hypnosis, on 3/5/93, she remembers hearing something in the bushes by the kitchen and then, "I see a crouched person running." Julie believes this individual was a man, someone bigger than herself, carrying a bundle under his left arm. The person ran "past the kitchen, across the driveway, through the bushes." (p.10). Later, on 7/26/94, while again under hypnosis, Julie further characterized this individual as, "Crouched, big, dark, maybe even hooded." 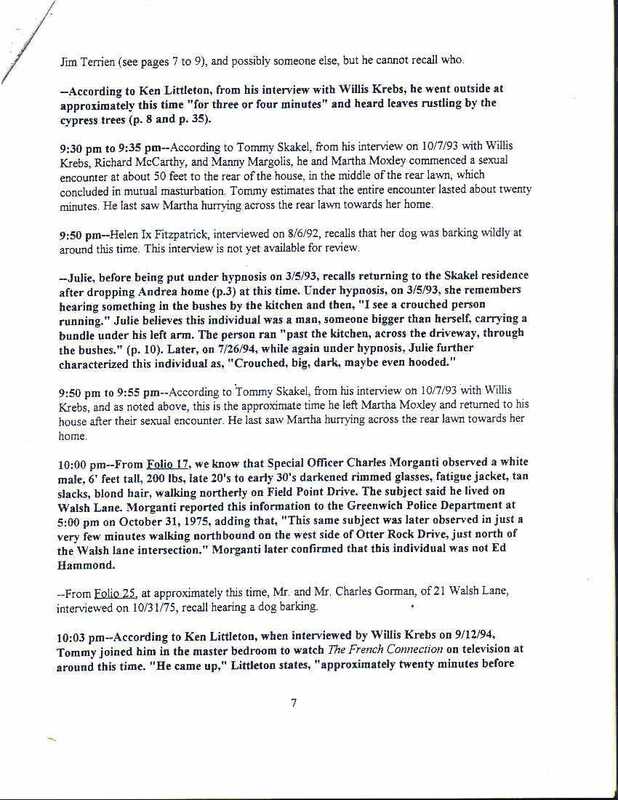 9:50 pm to 9:55 pm--According to Tommy Skakel, from his interview on 10/7/93 [footnote 1] with Willis Krebs, and as noted above, this is the approximate time that he left Martha Moxley and returned to his house after their sexual encounter. He last saw Martha hurrying across the rear lawn towards her home. 10:00 pm--From Folio 17, we know that Special Officer Morganti observed a white male, 6' feet tall, 200 lbs, late 20's to early 30's darkened rimmed glasses, fatigue jacket, tan slacks, blond hair, walking northerly on Field Point Drive. The subject said he lived on Walsh Lane. Morganti reported this information to the Greenwich Police Department at 5:00 pm on October 31, 1975, adding that, "This subject was later observed in just a very few minutes walking northbound on the west side of Otter Rock Drive, just north of the Walsh lane intersection." Morganti later confirmed that this individual was not Ed Hammond.